It’s the end of the summer….And that makes me unbelievably sad. It took me 3 weeks, but I have finally accepted it. And now I am ready for fall! 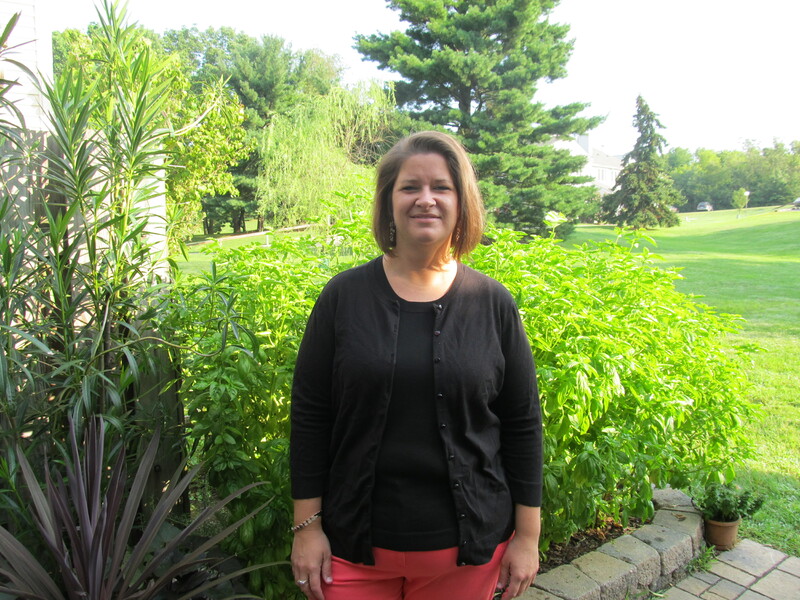 I had a great gardening year this summer. 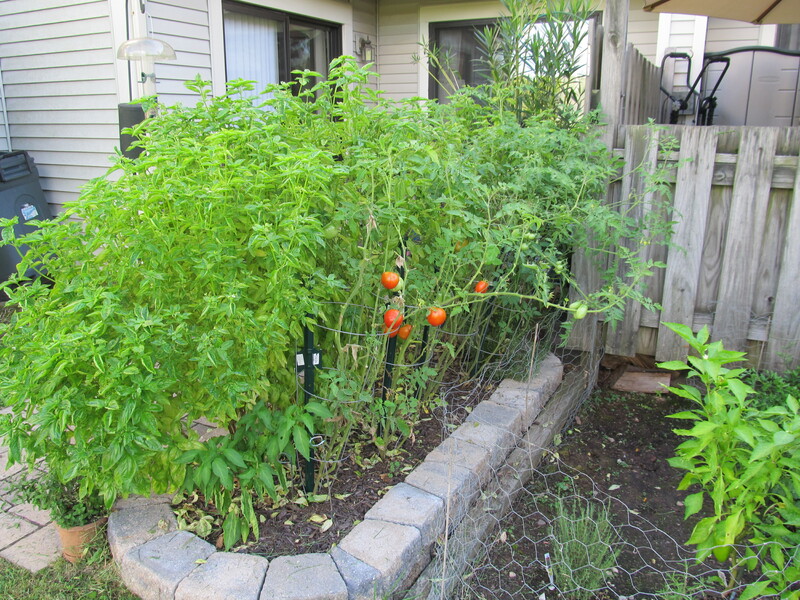 All four of my tomato plants produced a lot of fruit, and my basil has never been bigger. Above and below you can see how tall the basil is. I am roughly 5 ft 4 so you can see that some of the basil is over my head. 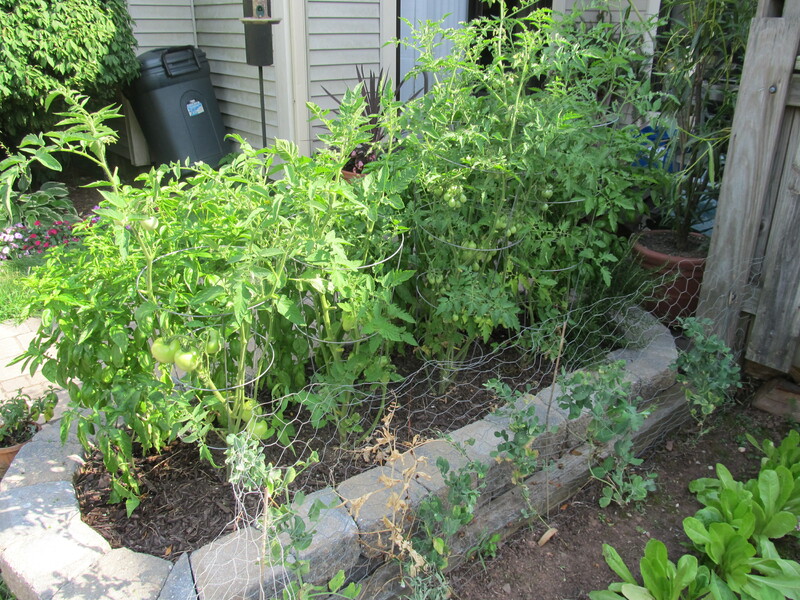 Below are some of the Early Girl tomatoes, and in the background you can see some green romas. 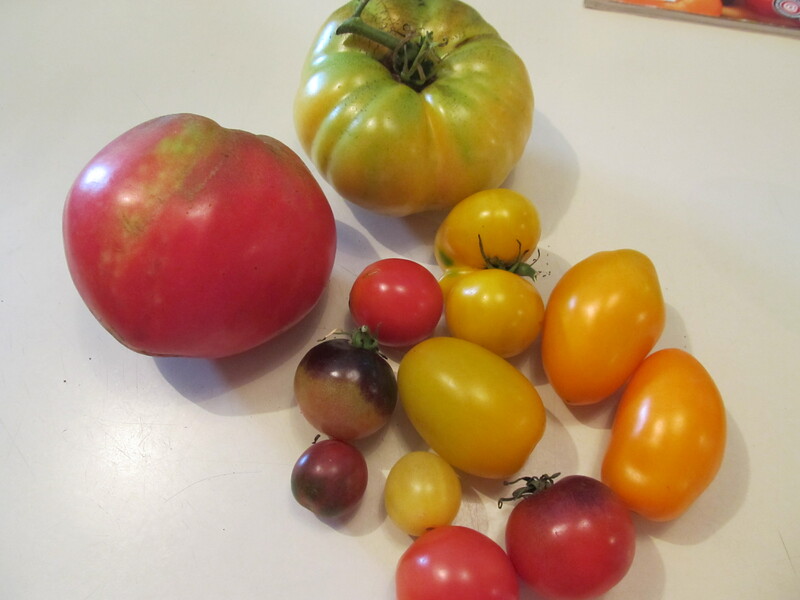 Some great farmers market heirloom finds…. 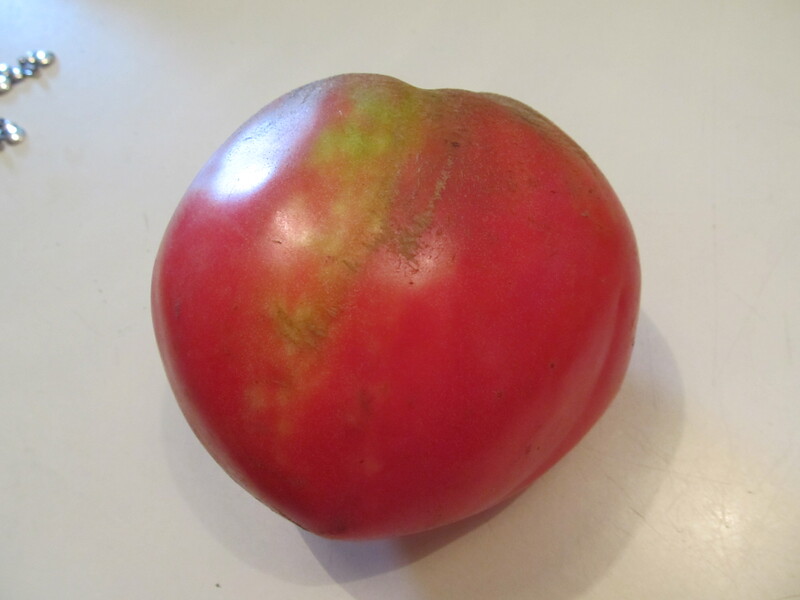 This is my FAVORITE heirloom tomato ever……the Ox Heart. It is most delicious with not that many seeds. Perfect with some kosher salt. I’ve had a bowlful of these on my counter since July……it’s great to just pop a couple in your mouth whenever you want. Le Sigh………bring on the fall apple and pumpkin flavors! Love it. It took me 32 years to understand it….but now that I do, I cant get enough of it! 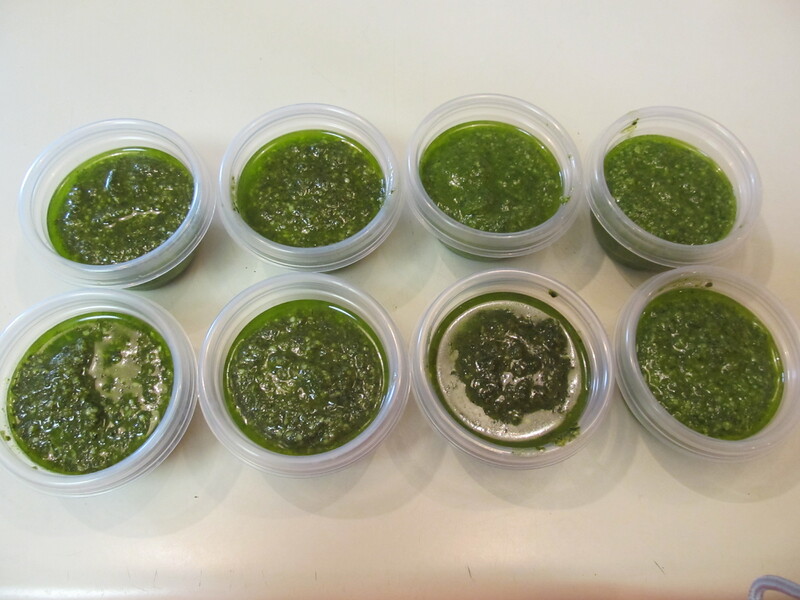 Typically, I grow at least 9 plants of basil every summer and in late September I whack them all and make 15-20 batches of pesto to freeze for the wintertime! Pesto is so easy. It’s adaptable. 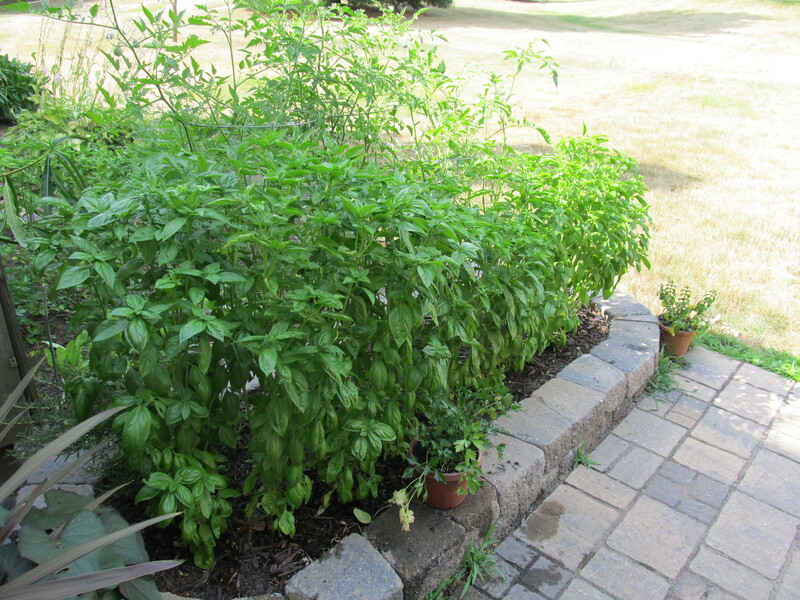 There are so many variations: basil, arugula, red pepper, parsley, sun-dried tomato, spinach…etc. There are variations on nuts you can use instead of the traditional pine nuts: pistachio, walnut, almond, sunflower seed….etc. You can also vary the types of cheese! Pesto is great! I stick with the traditional pesto though. 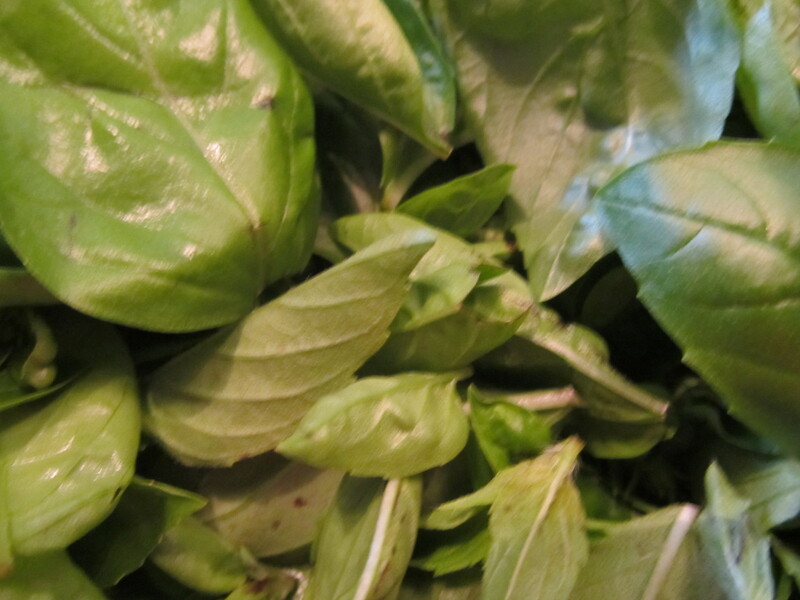 Recently, at one of my farmers markets, there was a vendor selling basil for “$2/a bunch”. 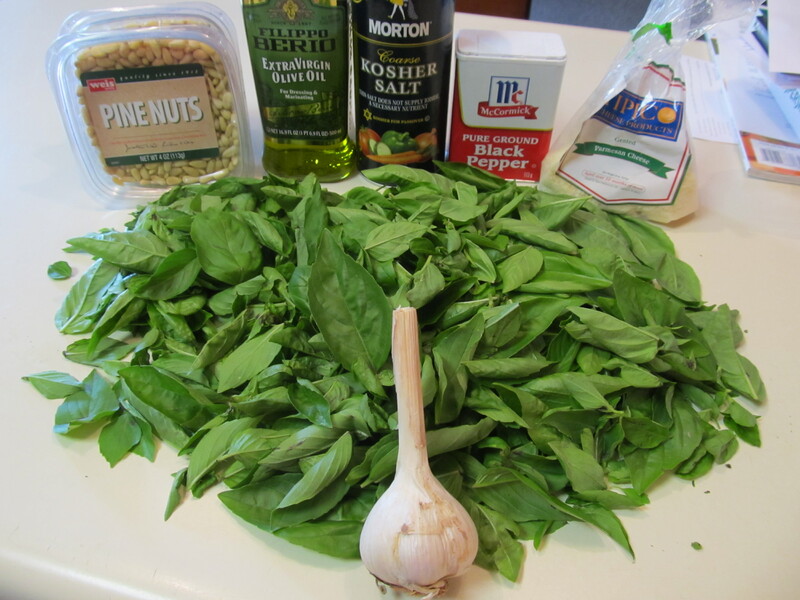 I said “how do you quantify a bunch?” to which she replied – “as much as you can carry with your hands.” I made out like a bandit and instantly knew I was making pesto! 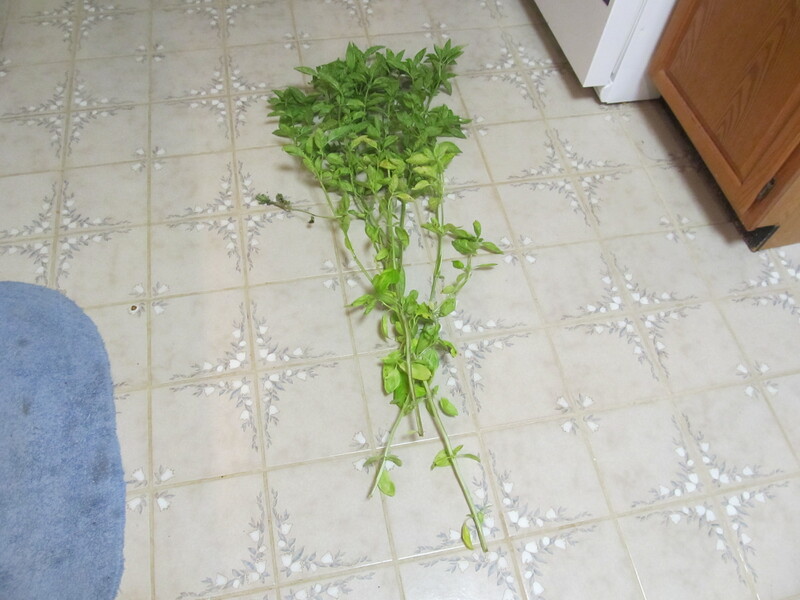 Look at this pile of basil!!!!!!! You can practically smell it, cant you? The hardest part about making pesto is trimming all of the basil. Here are all the ingredients dumped into the food processor. It’s as easy as that – dumping everything together into the food processor. Read the recipe to see my secret ingredient. Here is another closeup because this stuff is off the hook. There are a couple people who are FANS of my pesto (My brother Pat and my friend, Jeff). So I am always sure to freeze several containers and give them out when I see them. I ALWAYS have containers of it in my freezer to either take with me to someone else’s house or to enjoy in my own. 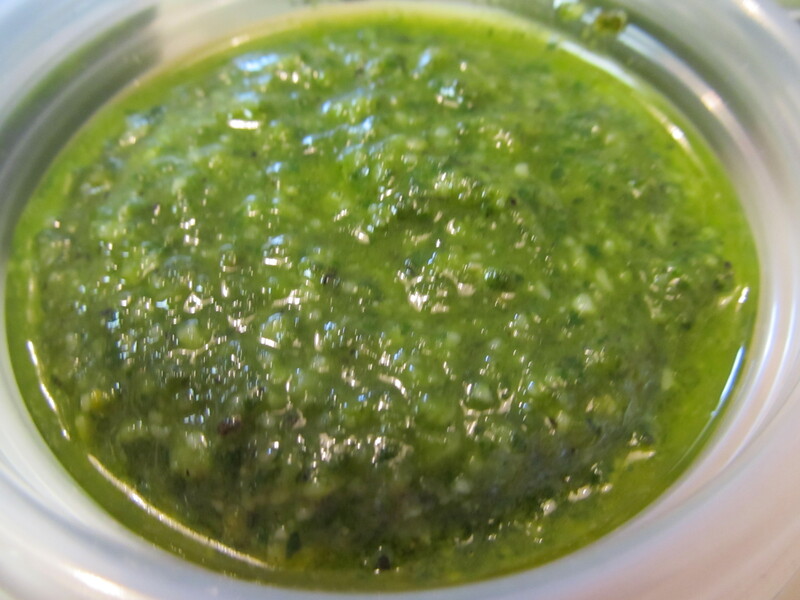 It is so awesome to have some fresh garden pesto on a dreary January day…..I think my brother and I are the only ones I know who can just eat spoonfuls of this stuff. Isnt that gross? So gross, but so good!!!!! 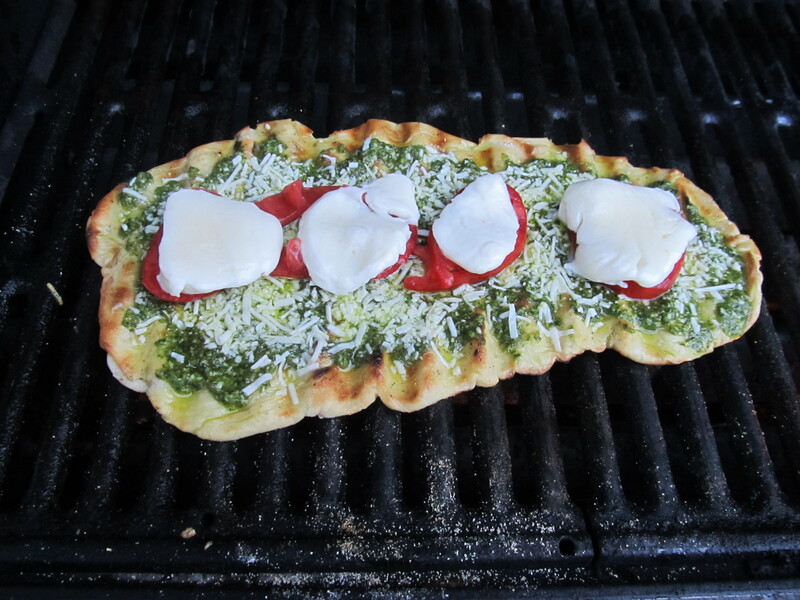 And here was the recent grilled pizza I made with this pesto on this day. It was so darn good. I feel like the vendor had a couple strands of Lemon Basil mixed into the regular Genovese Basil because there was a bright lemony taste! 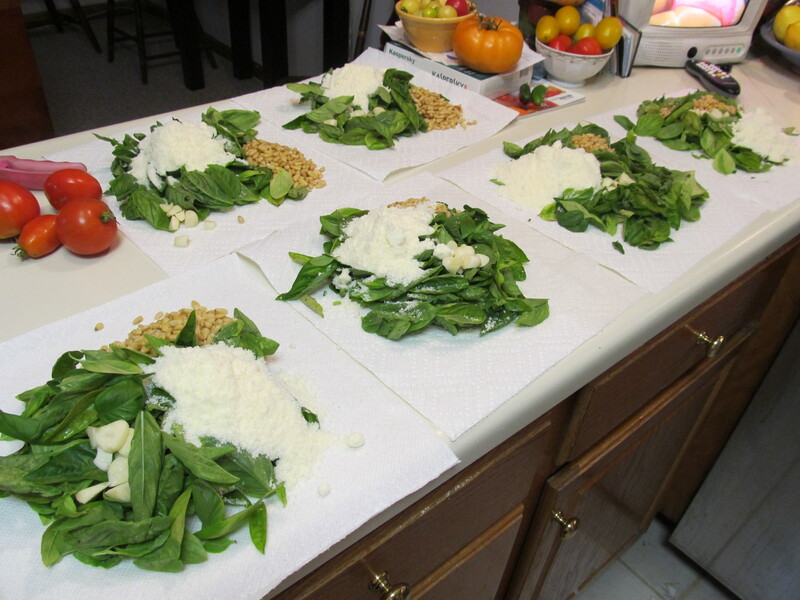 Here is the assembly line of ingredients to make it easy to dump into the processor and keep moving. 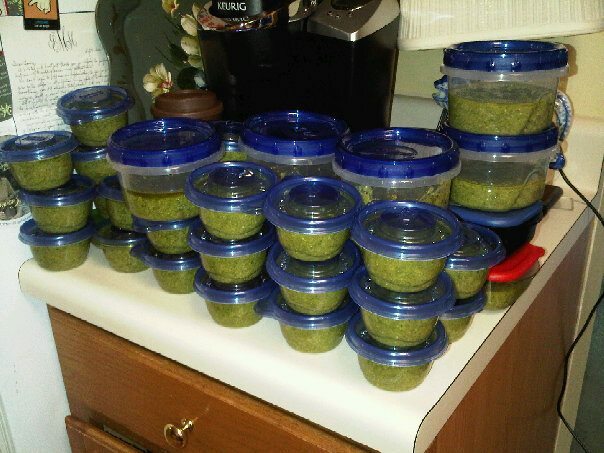 What in the world does 18 batches of pesto look like? Well, to me it looks like heaven…. 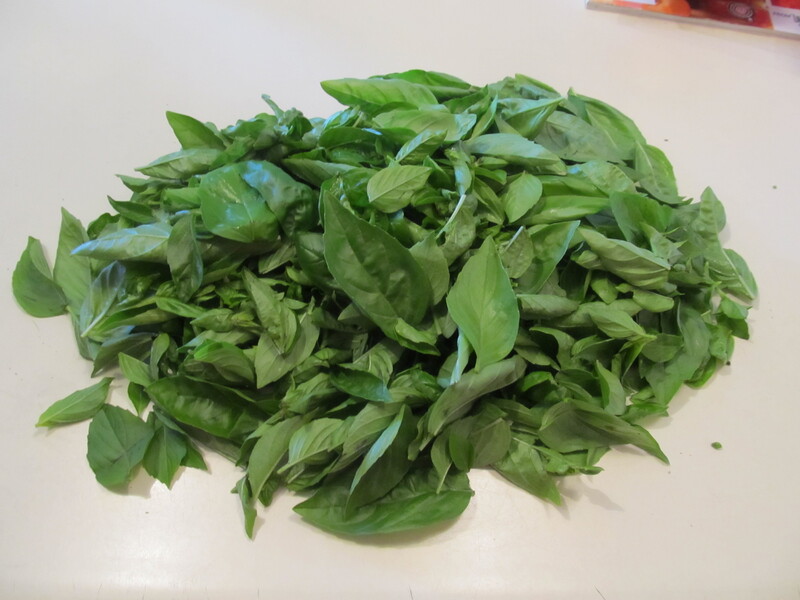 De-stem and wash all basil leaves and dry thoroughly. 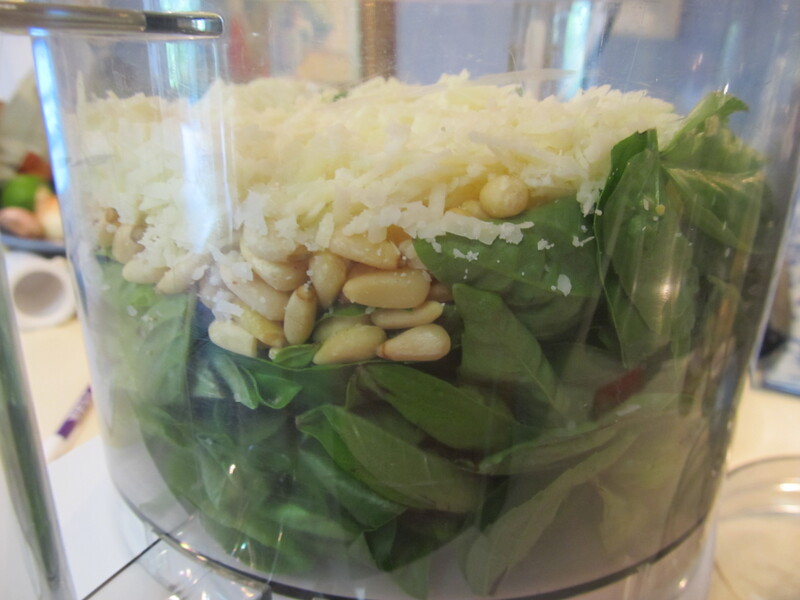 Place in food processor with pine nuts, garlic, parmesan, and salt/pepper. 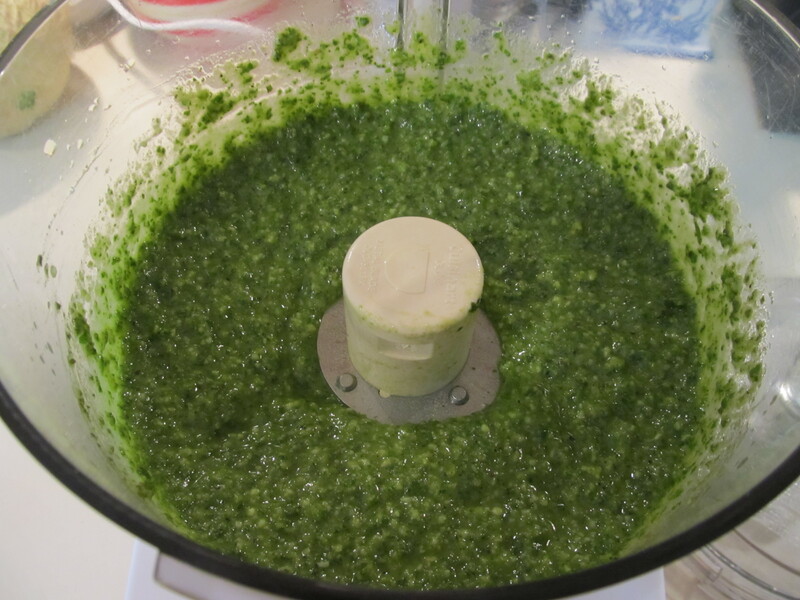 Turn food processor on and grind until it forms a thick paste (about a minute). Now, you may not want to add the anchovy. And you dont have to! But it adds another dimension to the flavor and makes it richer. I really enjoy it – it does NOT taste like anchovy at all. Drizzle in olive oil while food processor is still running and run for another 1-2 minutes. Done! 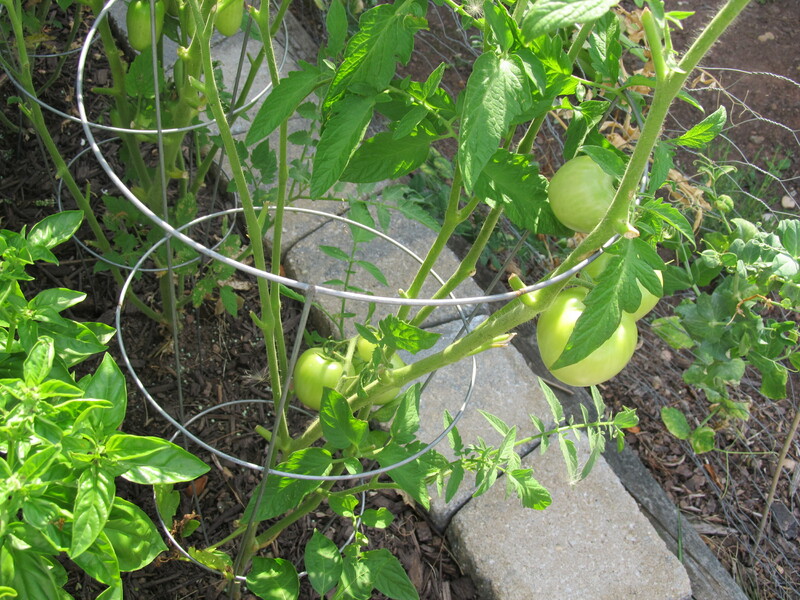 Are your cherry and grape tomatoes coming in like gangbustersright now? I am picking at least 7-10 a day and they add up so fast. Sometimes I give them out to friends and co-workers, and other times I am able to consume them on a daily basis. 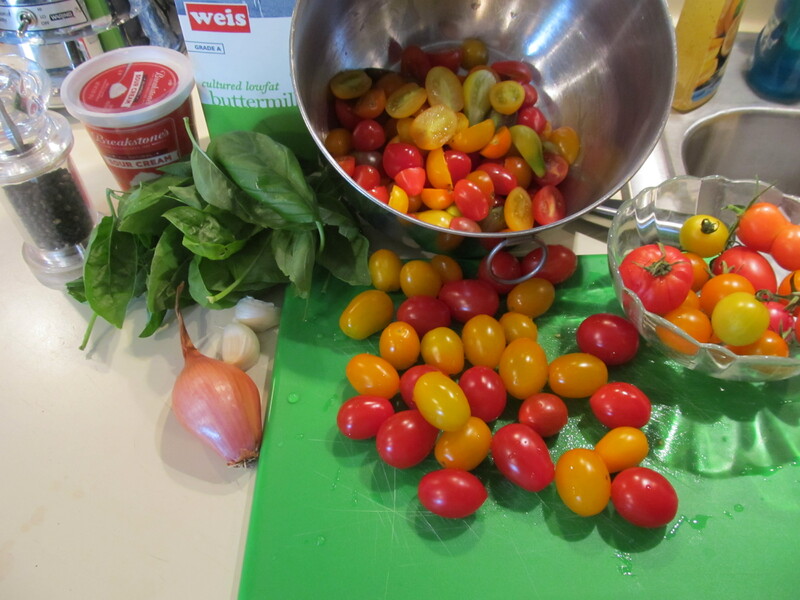 I was able to make this delicious and healthy salad out of my cherry and grape tomatoes with only 5+ ingredients. It is creamy, without any cream. 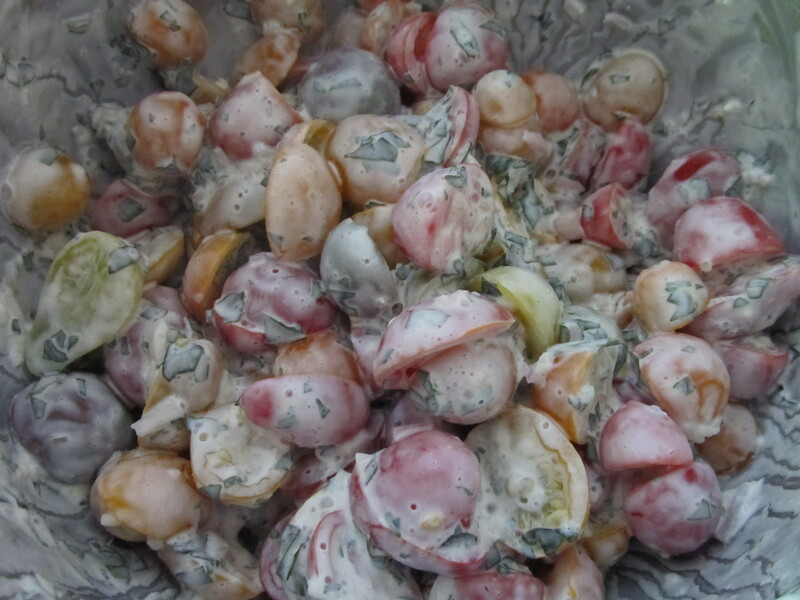 In a weird way, it could be a nice substitute for a potato salad, too! This salad is incredibly easy to put together and takes hardly any time. It would be an awesome addition to any summer picnic or BBQ. 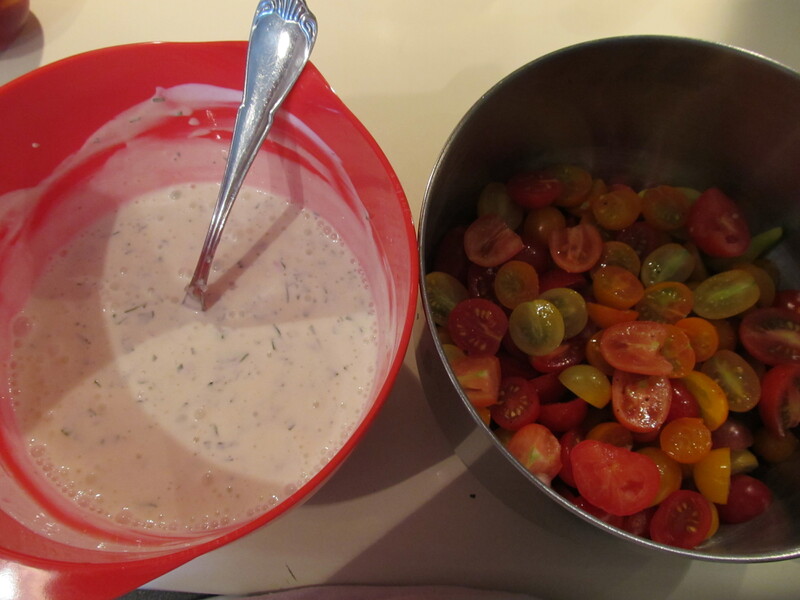 Put the cherry tomatoes in a large bowl. Season with salt and pepper and toss. 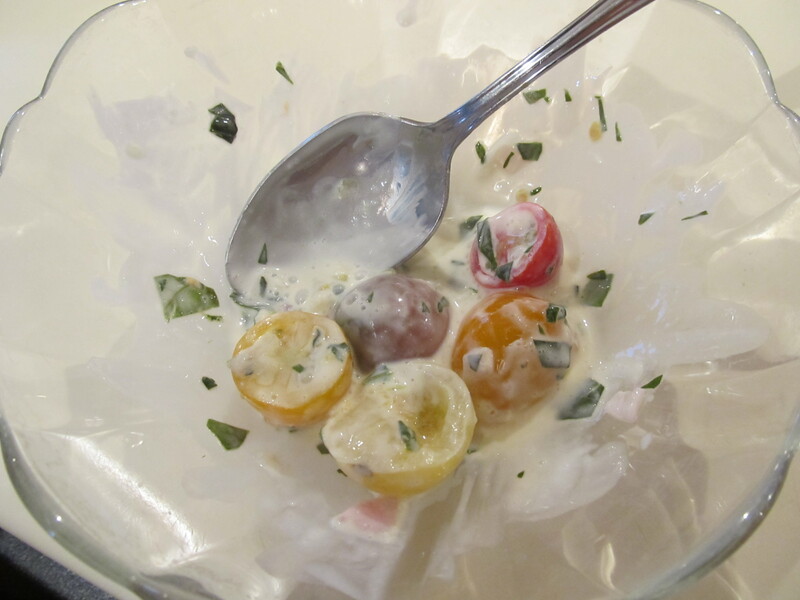 In another bowl, whisk together buttermilk, sour cream, basil, shallot, and garlic. Season with pepper. Drizzle the dresing over the tomatoes and toss. So it’s mid-summer and I wanted to take a pulse on the growth of the garden so far. 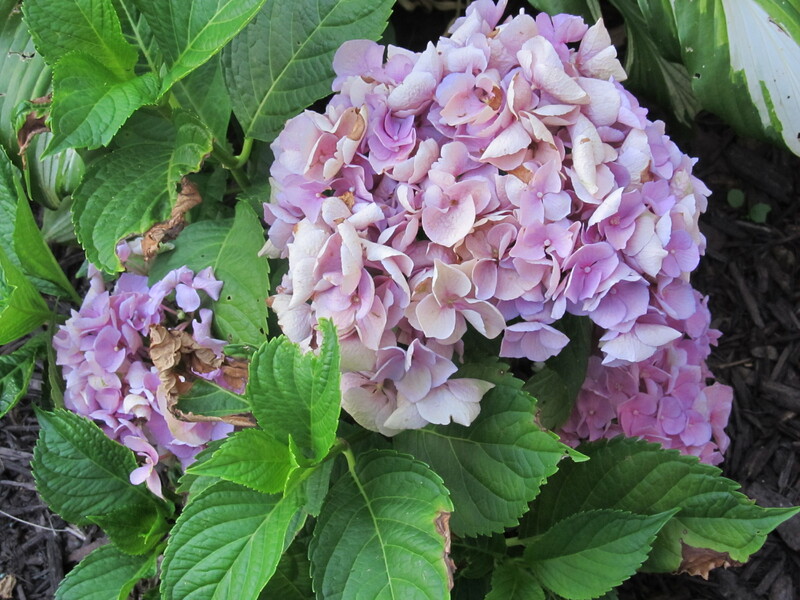 I spend as much time watching it and inspecting it and, lately, watering it like crazy due to the heat and lack of rain. My basil is growing like gangbusters!!!! I am nuts about ensuring I pinch off all the flower buds before they start growing. This makes the taste of the leaves better (not bitter) and also allows the plant to keep sending shoots up from the ground instead of getting taller and flimsier. 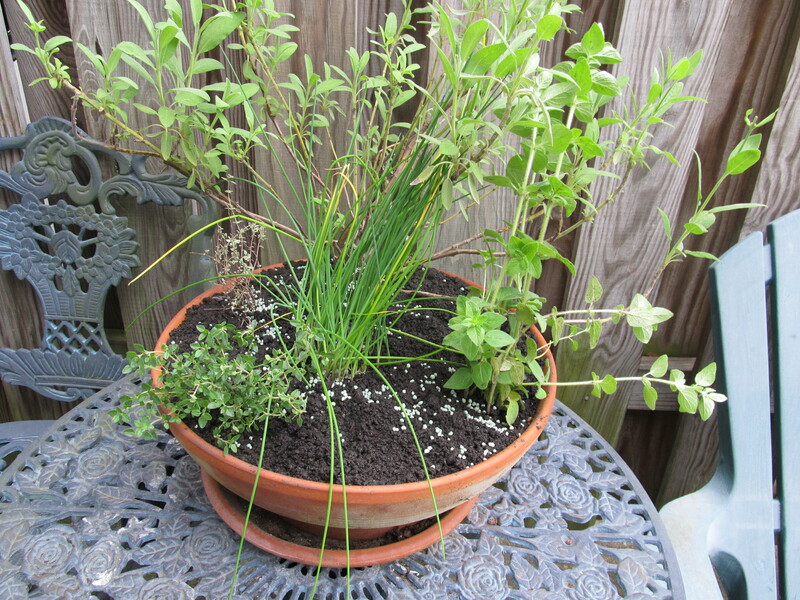 I’ve been pinching leaves here and there for recipes – and loving every bit of it! 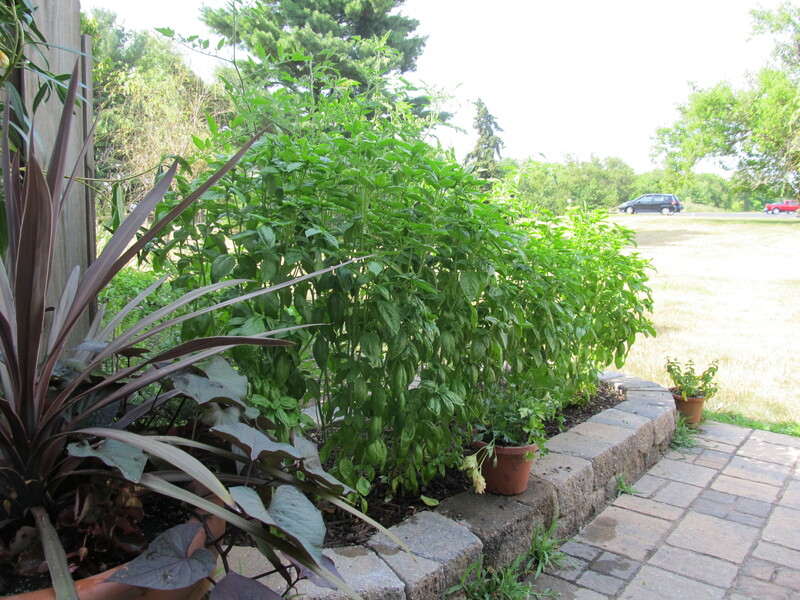 Look how tall that basil is! My tomatoes are doing really well! 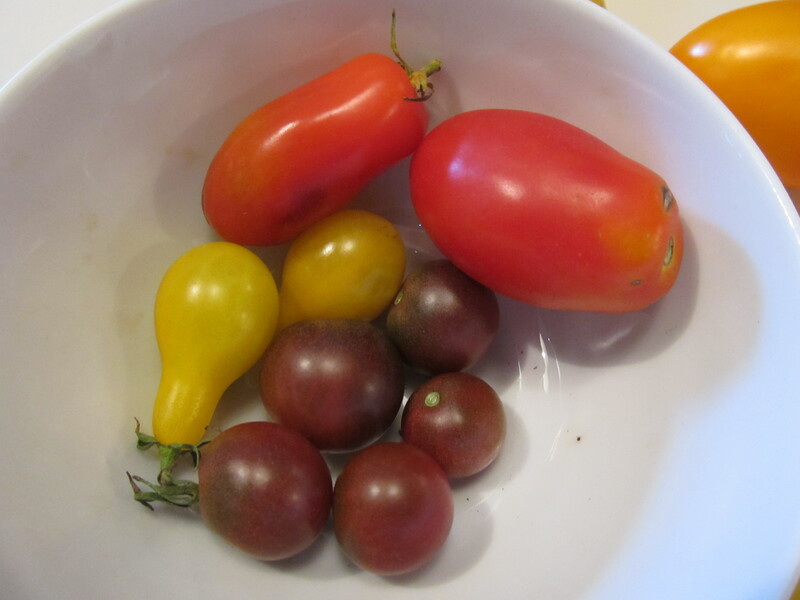 I have a zillion black cherry and yellow teardrop tomatoes that I am practically trying to COMMAND to turn ripe every day when I walk past……I also have roma tomatoes – it’s hilarious to watch tomatoes grow in an oblong oval shape. 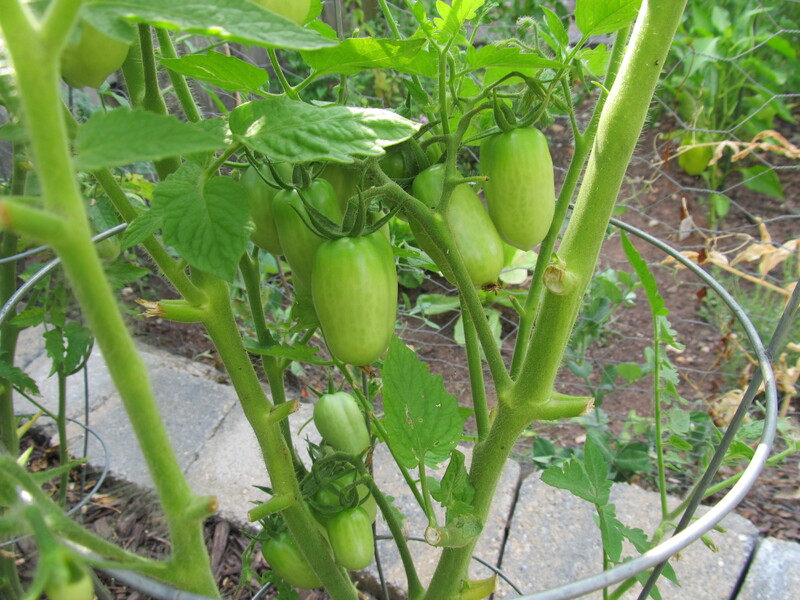 And my Early Girls are large and green…….I am willing them to turn ripe as well. I forgot to get a pic of my jalapeno plant…..but there are 3 decently-sized peppers on there, and I picked and used one last weekend for my muffins. 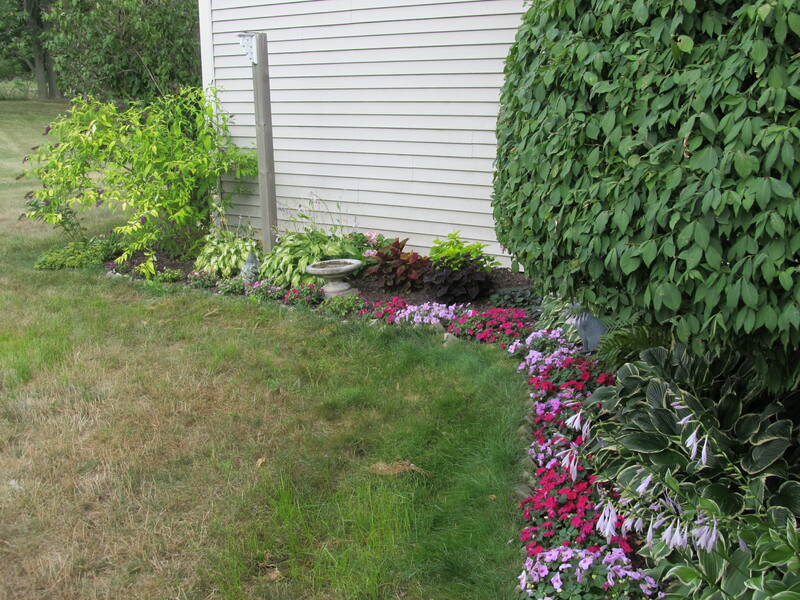 And then there’s my flower garden – it’s all come to life! The butterfly bush and milkweed are attracting TONS of monarchs and other butterflies – love watching it! I’ll update again in the middle of august to see how everything is growing! In the meantime, let’s all do a lil rain-dance – not only for me and other casual gardeners, but for our local farmers, too!! 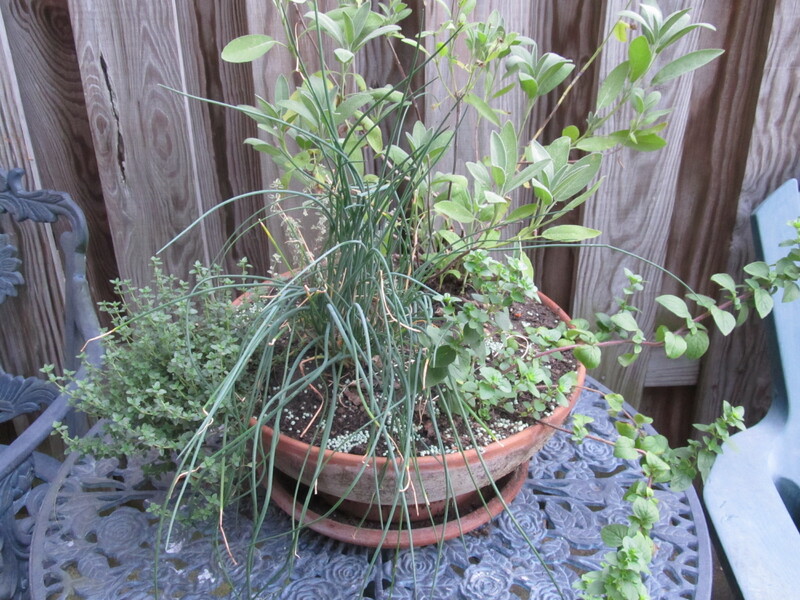 Gardening Weekend…and the Farmers Market! 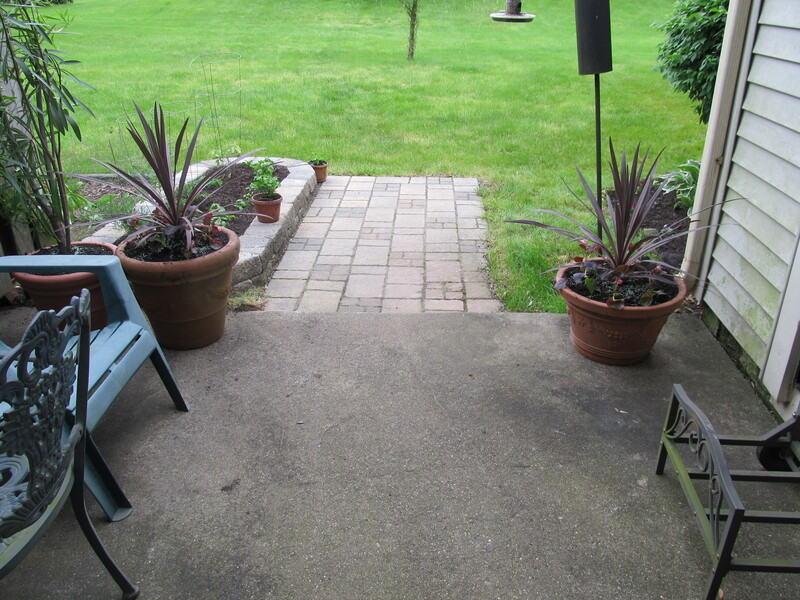 The forecast for this weekend was supposed to be 78-82 degrees, 100% sunny, and slight breeze….PERFECT for gardening! 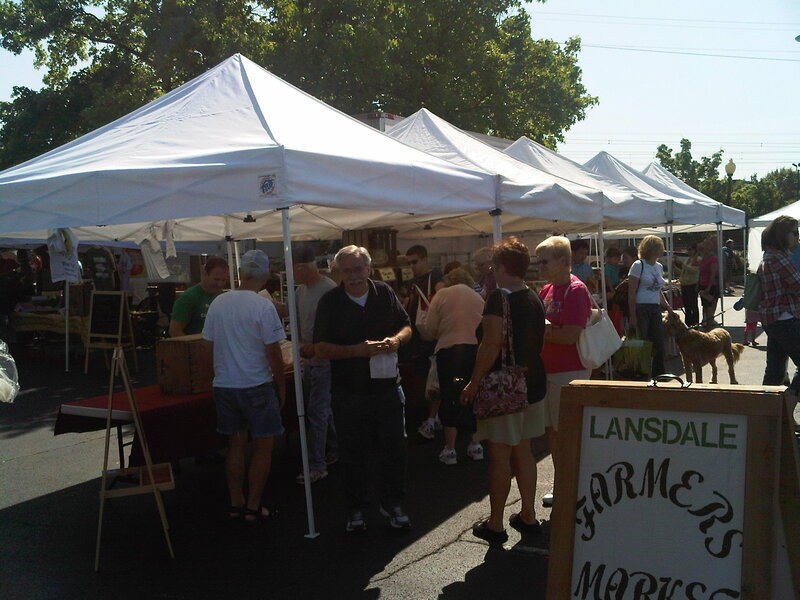 This weekend was also the opening day of the Lansdale Farmers Market! I’ll have to do an update of pics later in the season to show all of the fabulous produce. Obviously, since it’s May, there isnt much in the line of produce at all. Tabora Farm and Orchid – great stuffed rolls and breads! I’ve been frequenting their stand since the market first opened. 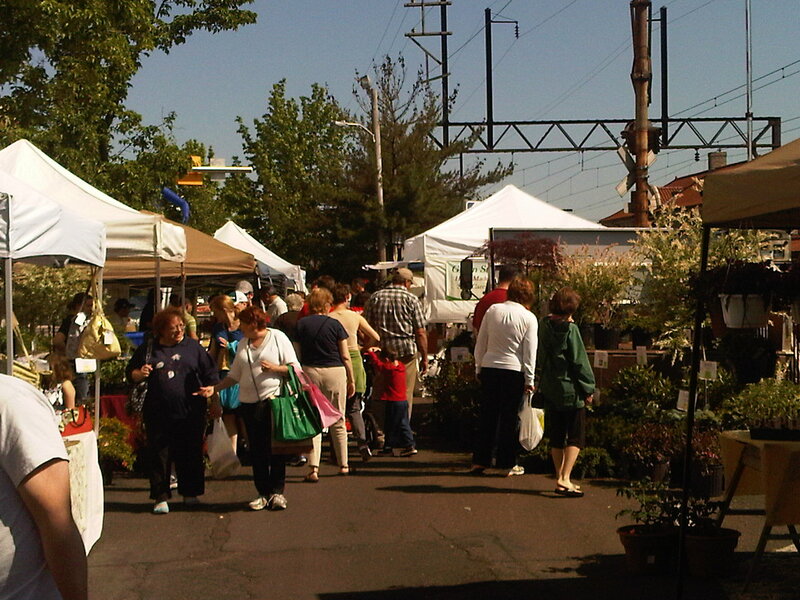 Overbrook Herb Farm – my favorite stand at the market. Paul and his wife are the most gracious people with their wonderful produce and amazing knowledge of all plants and herbs. They always have something unique and I always come away having more information and knowledge than ever! 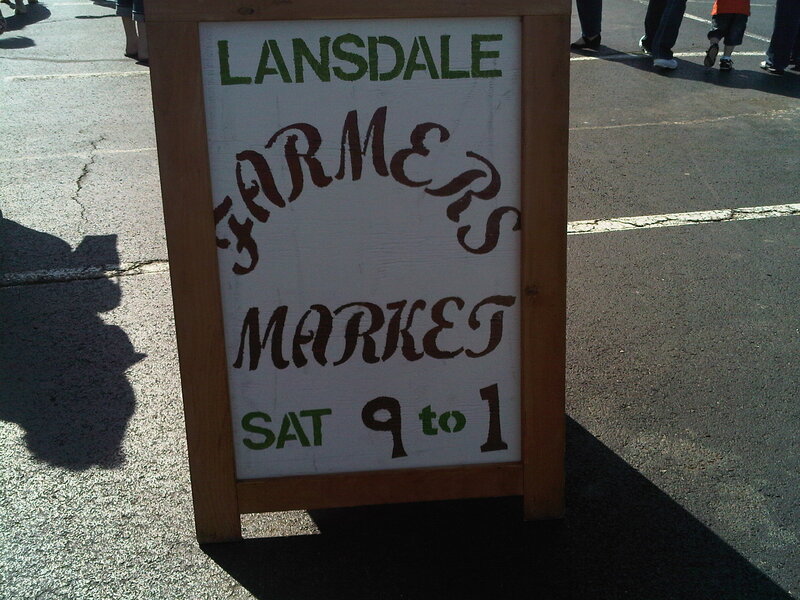 Their produce and herbs are phenomenal and their prices are super! 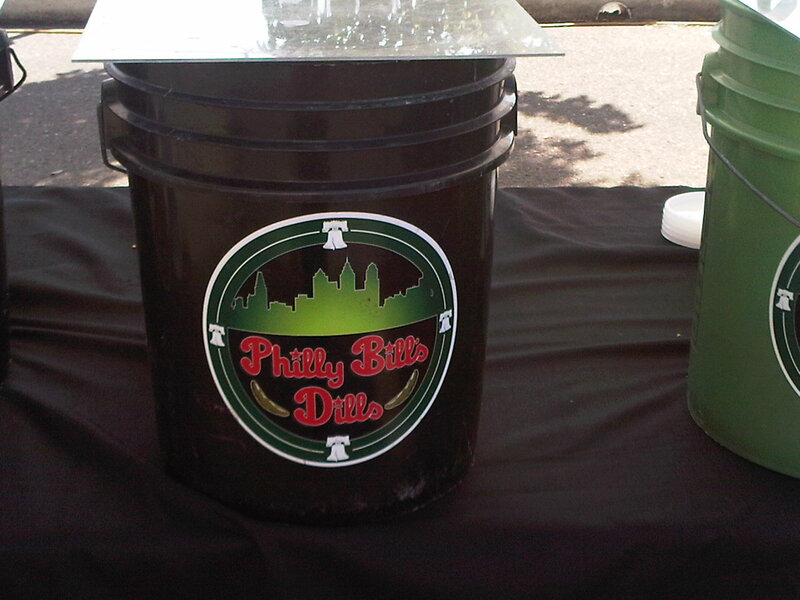 Philly Bill’s Dills……I love pickles. I am addicted to their habanero and jalapeno pickles! 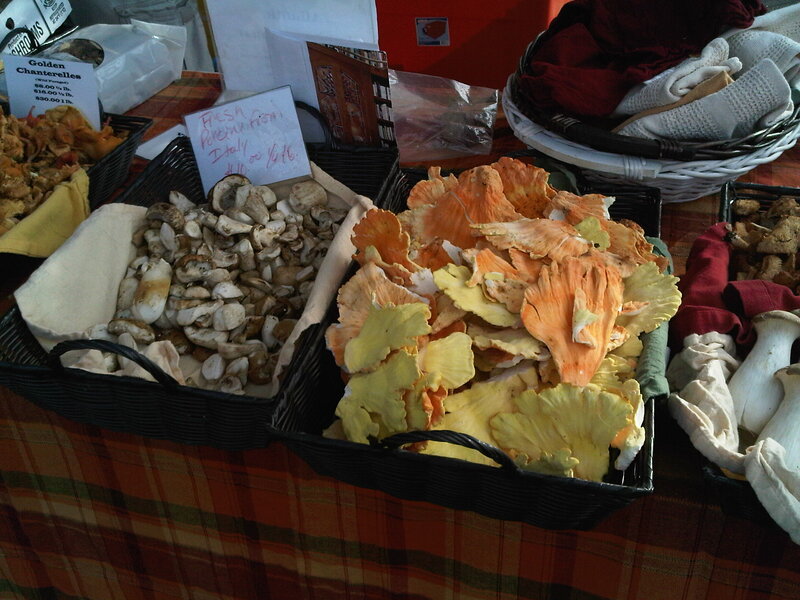 Mainly Mushrooms….This was a new stand in the middle of the season last year and I fell instantly in love. 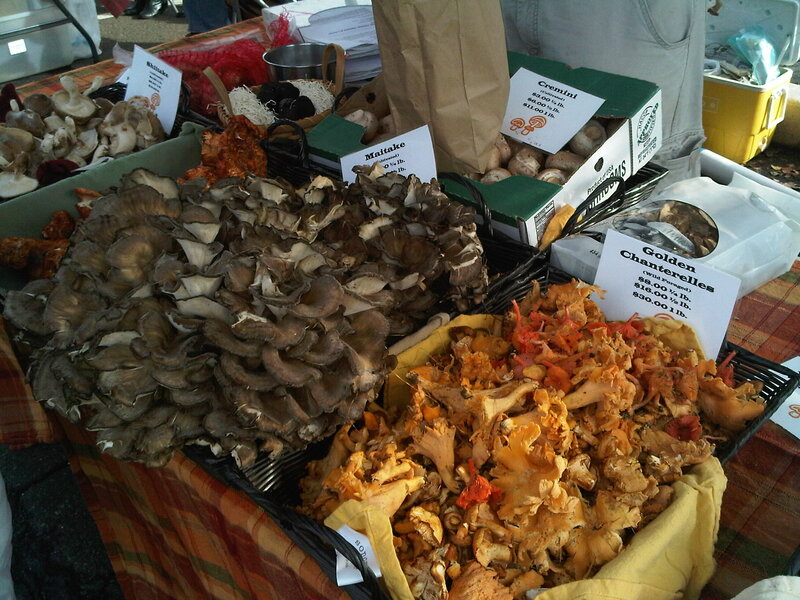 Chris has such a fabulous collection of mushrooms that he has foraged and also has foraged for him and shipped. Some are also cultivated. 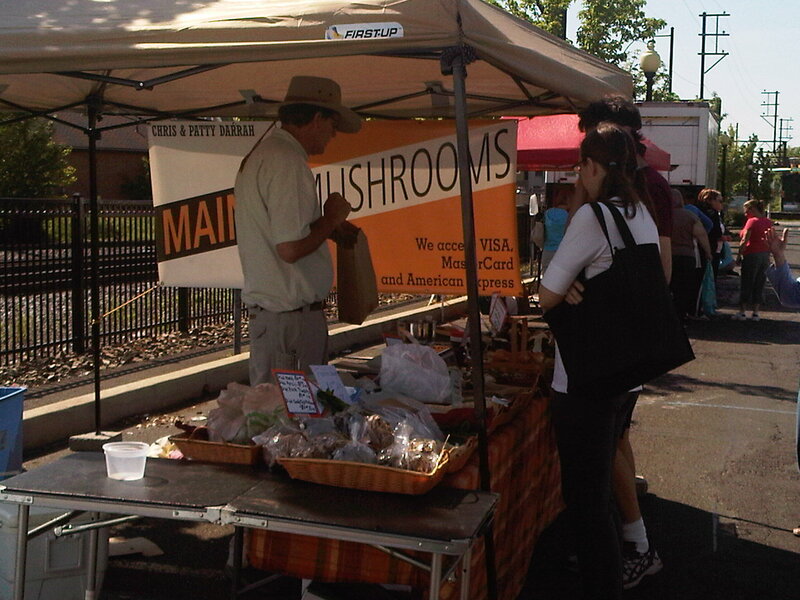 He has signage that clearly explains what the mushrooms are and where they have come from. He also has interesting things other than mushrooms – like ramps and fiddleheads and dried mushrooms. My favorite are the locally harvested maitake that come out later in the season. I’ve also had his lobster mushrooms – they TASTE like lobster and you can put them in eggs and risotto. Delicious! 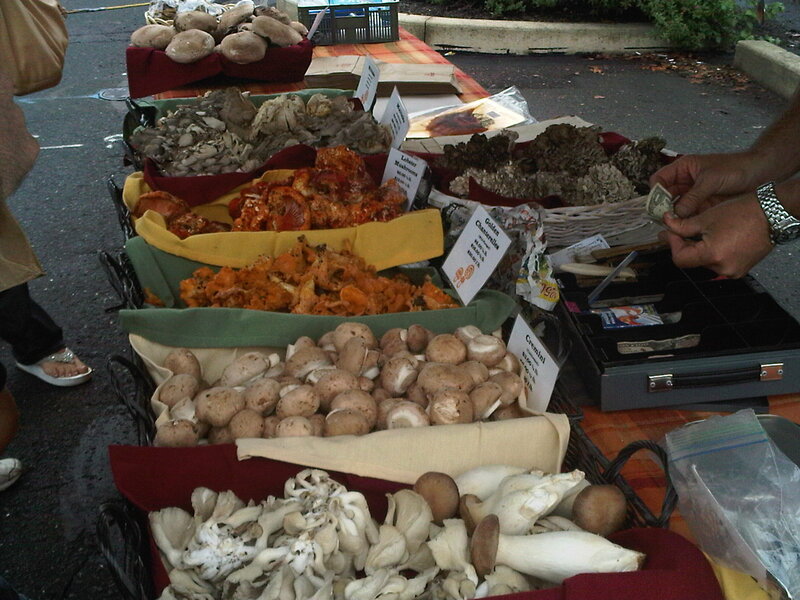 Chris will tell you how to cook up your various types of mushrooms in order to get a great flavor from them. 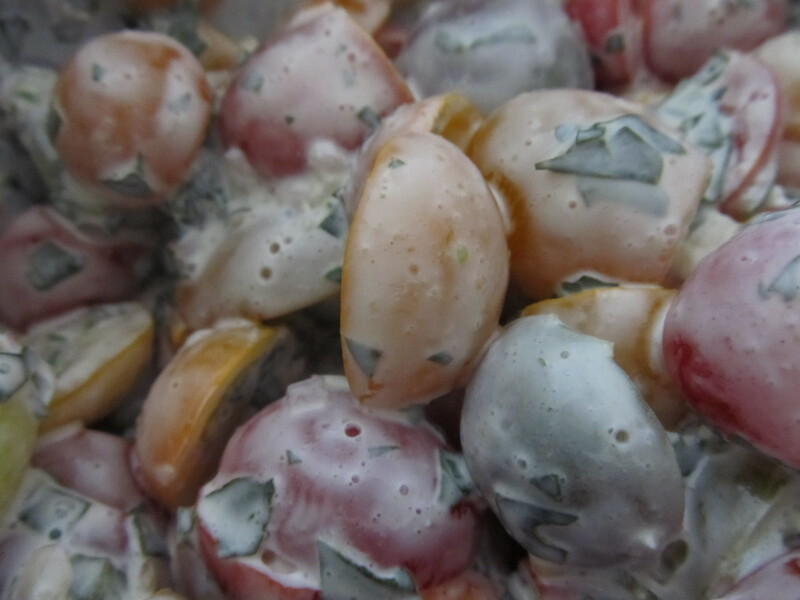 Lobster musrooms – it even looks like lobster meat! 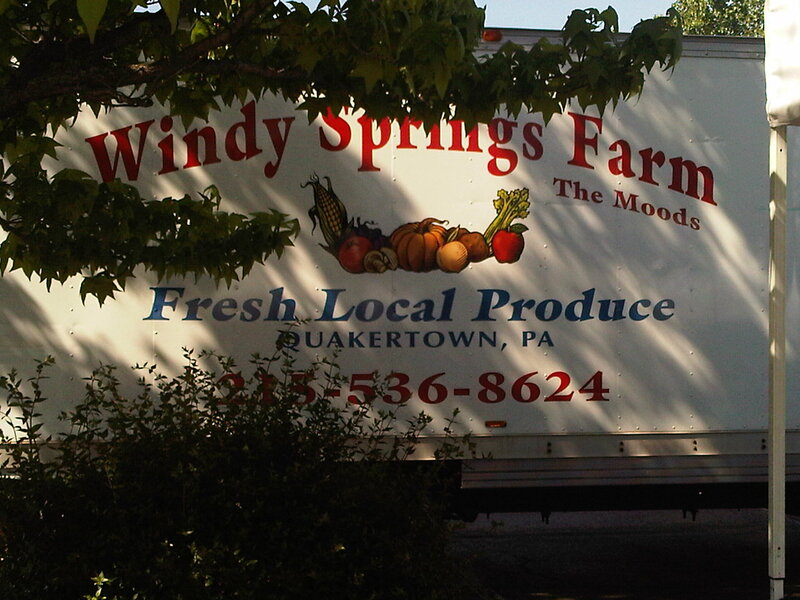 Windy Springs Farm…..I love their produce. It tastes AWESOME and is always priced so well. I frequent their stand for tomatoes, cantaloupe (honestly, the BEST cantaloupe i’ve EVER tasted), and zucchini. In the fall, I get my pumpkins and squash from them! Today they only had honey and beef and eggs. I bought 2 dozen of their eggs that were just laid that morning – talk about fresh! I am planning to try their meat this summer. My neighbor swears by it. 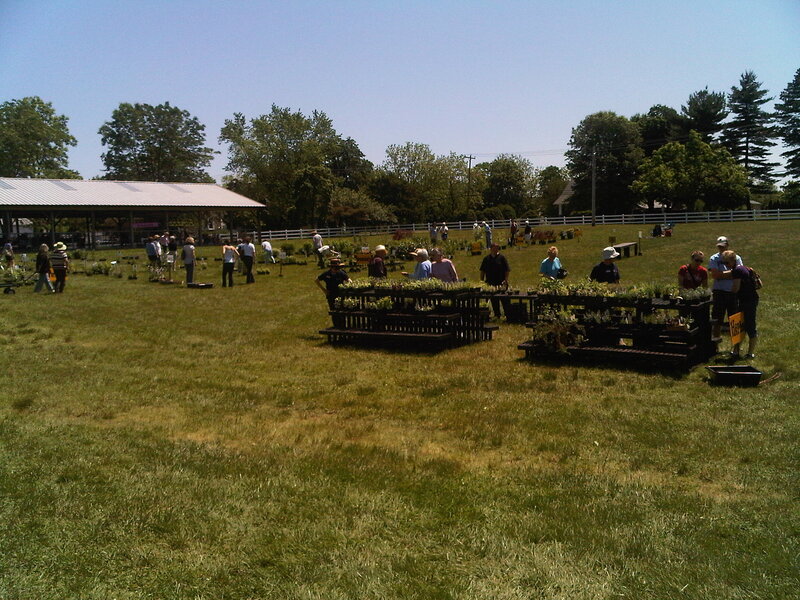 It was also the local 4H Plant Sale. I had never been but heard that it was one of the best plant sales around! 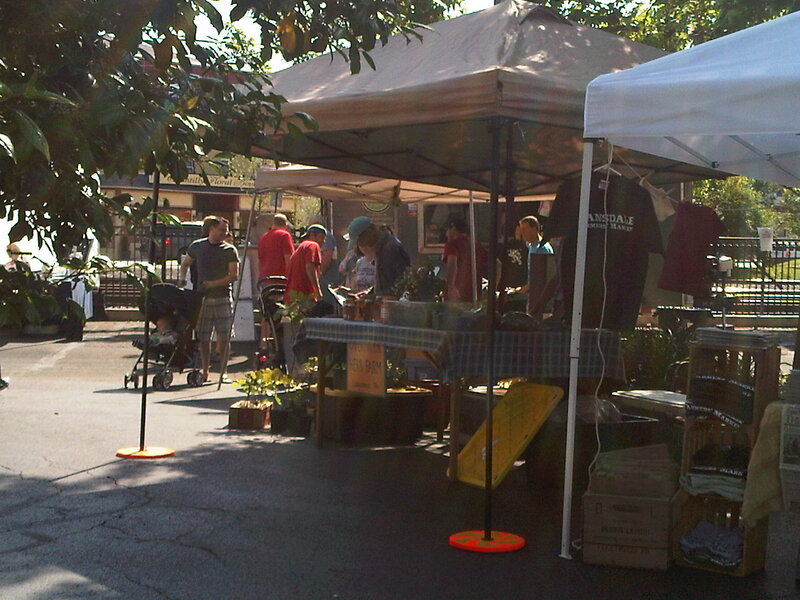 They have nursery/gardencenter-sponsored plants for sale in all types of species. 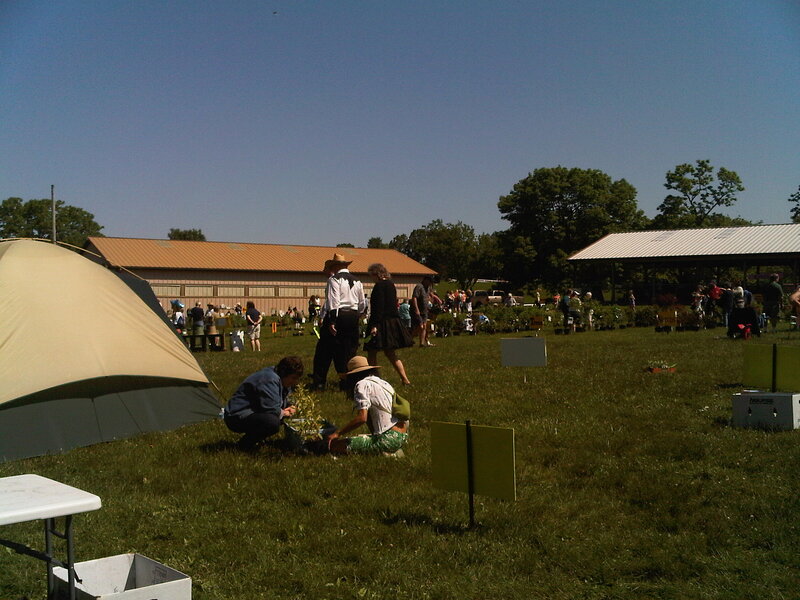 They also have plants that Master Gardeners have started and planted for sale…..There were some amazing collections! They had a TON of heirloom veggie plants and fruit plants, annuals, perennials, herbs, bushes, shade plants, trees, and pond plants. It was FABULOUS. I know for next year to get up EARLY and stand in line when it opens! 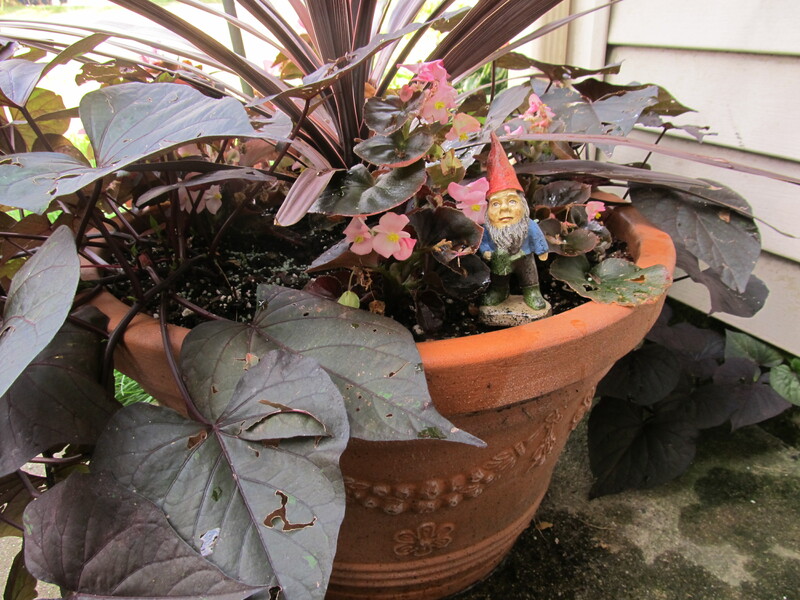 After runing some more errands, I was ready to start gardening! I love this time of year. Since it was about 3:30 and I was getting a late start, I decided to do my front yard to get it over with. 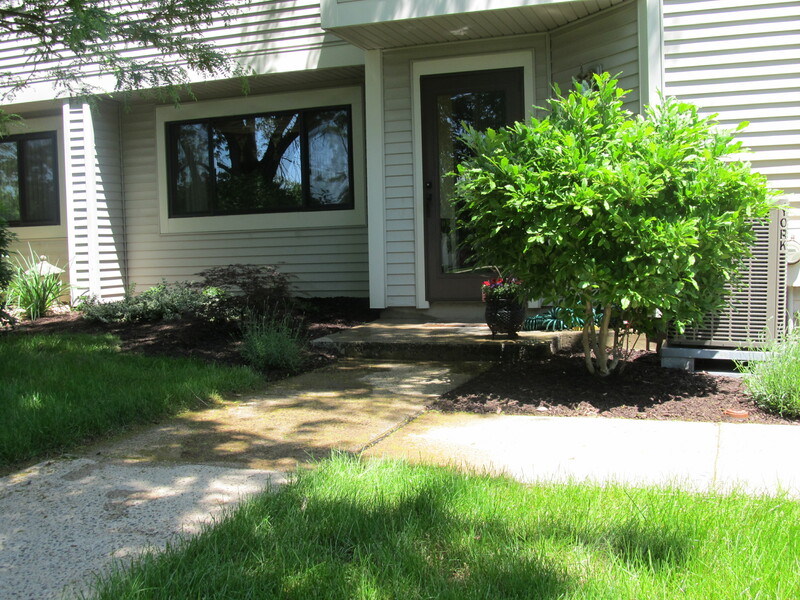 I had 5 azalea to plant and then all the mulching. 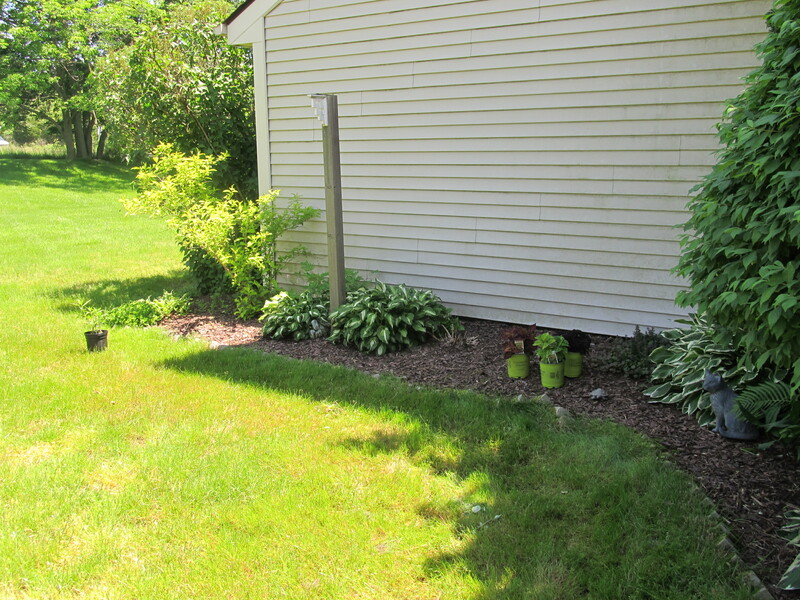 I loathe mulching, but when I start doing it I realize how easy it really is! 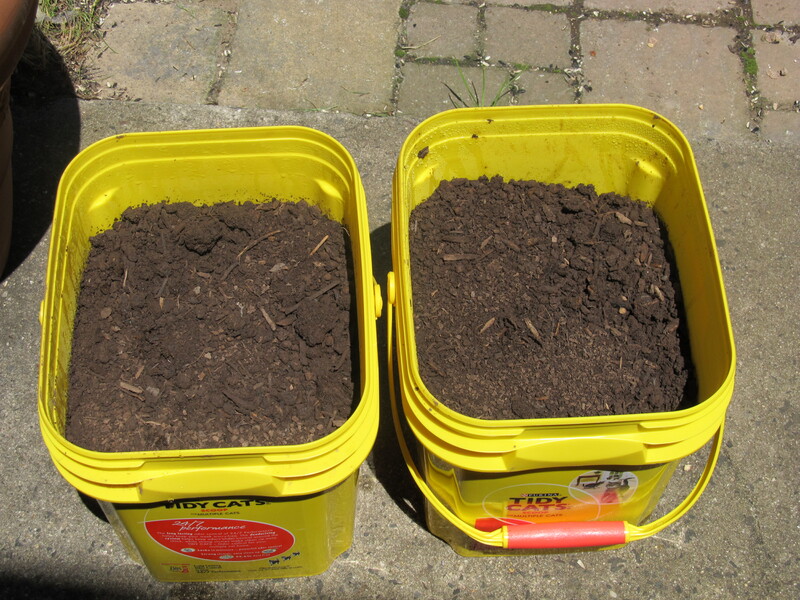 I should have taken a before picture…I only have an after picture though. Sunday is the day for the backyard! 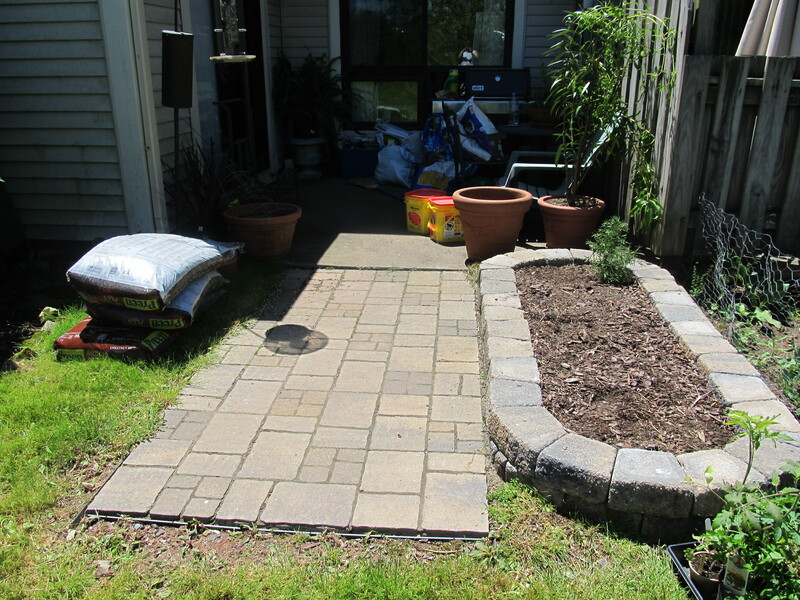 After some rest in the morning, it was time to turn the backyard into a thing of beauty. 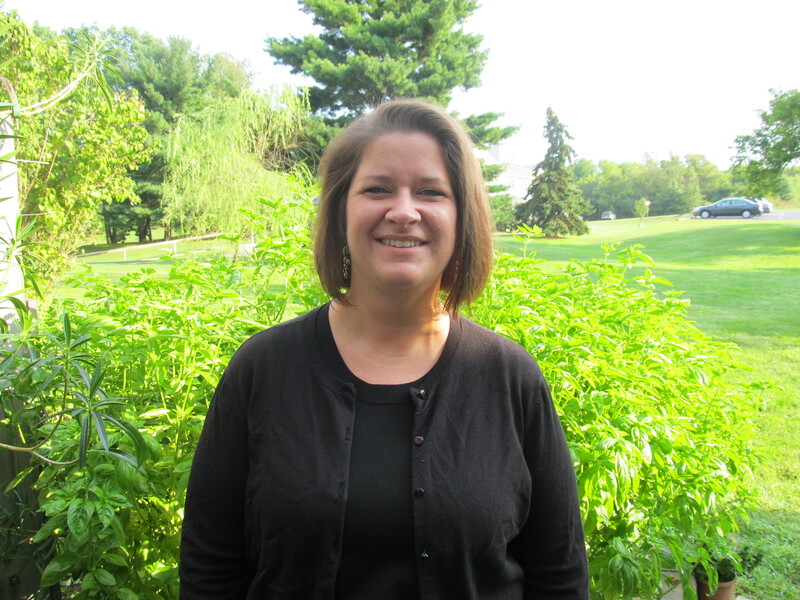 I got ALL of my vegetables from my local farm that I adore – Skippack Creek Farm. 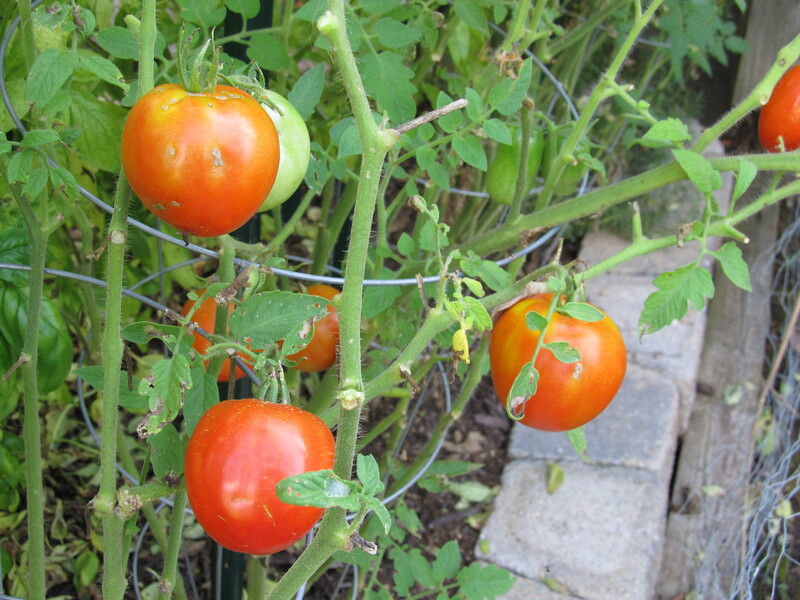 They are all organic, chemical/pesticide-free, and their tomatoes are to DIE for, amongst their other delicious produce! They are the reason I have fallen in love with Oxheart Heirloom tomatoes. They are generous and great to talk to! Anyway, here are my before pics…. 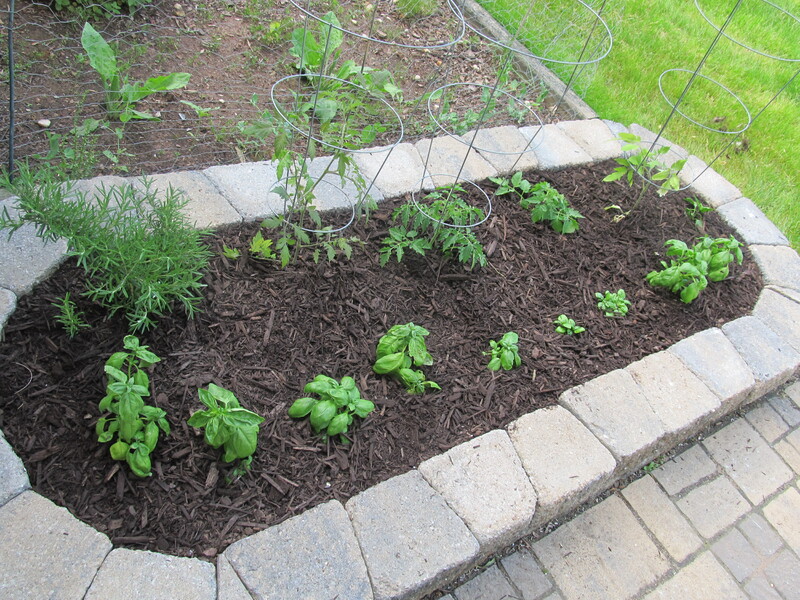 Tomatoes in the back, rosemary on the left, jalapeno at far end, and 9 basil plants! 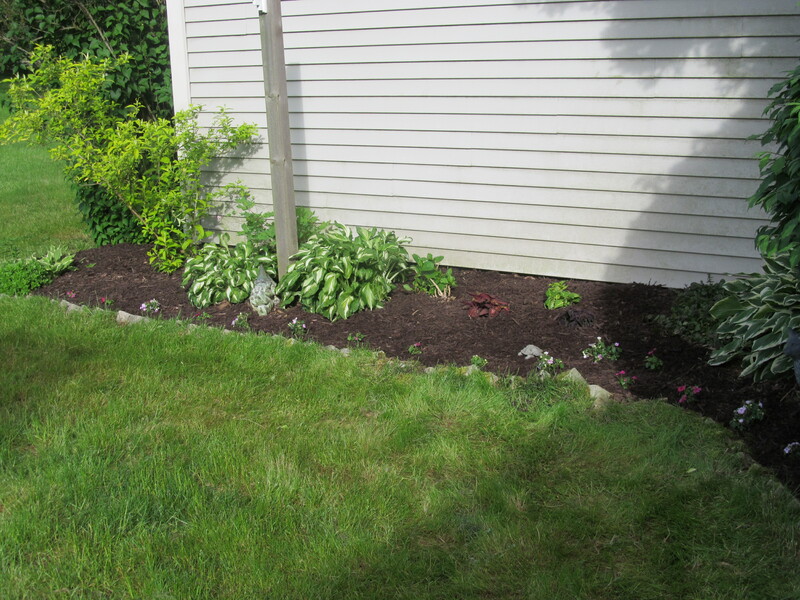 Impatiens, choleus, and milkweed planted and mulched! 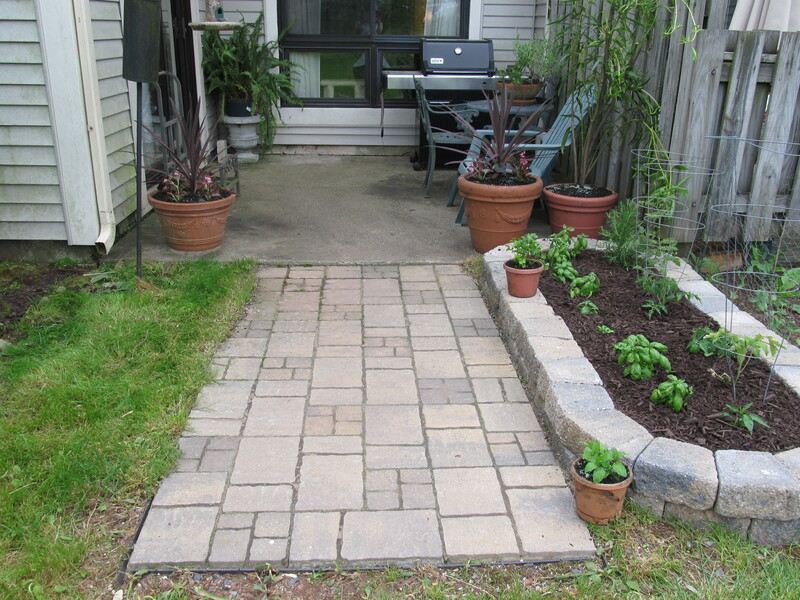 I am exhausted, but sooooo happy that all the plants are in the ground. Now I sit back and watch and water 🙂 I hope everyone else was able to take advantage of the beautiful weather we had this weekend!! !